This is a call for researchers in different nations to investigate how national debates about climate change policies have expressly considered or not ethics and justice issues in formulating climate policies. So far we have researchers who have committed to produce papers on Australia, Bangladesh, Cameroon, Canada, Chile, China, Equator, Germany, Ghana, India, Japan, Kenya, Netherlands, Nigeria, Malawi, Mauritius, Marshall Islands, Nepal, Panama, Russia, South Africa, South Korea, Thailand, Turkey, Uganda, United Kingdom, and USA. We are also looking for researchers from other nations. identifies additional guidelines on producing the research papers. 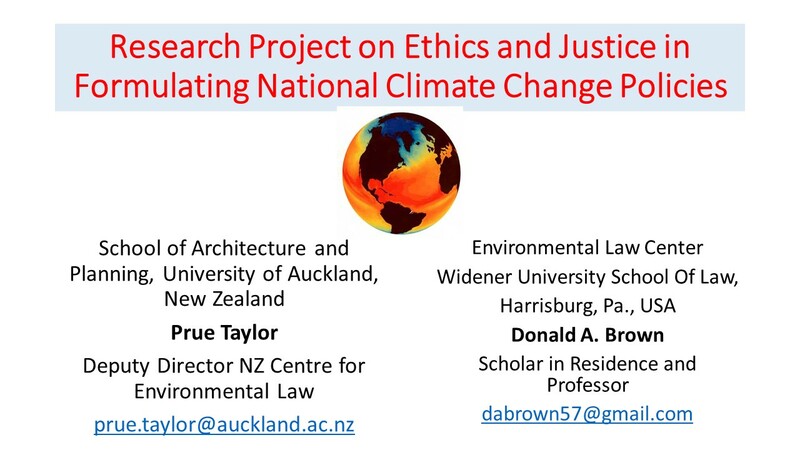 This new project has been organized by Widener University School of Law, Environmental Law Center and the University of Auckland, School of Architecture and Planning. As the following explains, those interested in participating in the research project should email Prue Taylor at the University of Aukland at prue.taylor@auckland.ac.nz and Donald Brown at Widener University School of Law at dabrown57@gmail.com indicating your interest and the nation you will research. This program will encourage researchers around the world to investigate how individual nations have or have not taken ethics and justice into account in their national responses to climate change. There is widespread agreement among many observers of international attempts to achieve a global solution to climate change that there is little hope of preventing dangerous climate change unless nations take their equity and justice obligations into account in setting national responses to climate change. In ratifying the United Nations Framework Convention on Climate Change (UNFCCC), nations agreed to adopt policies and measures based upon “equity” to prevent dangerous anthropogenic interference with the climate system. Yet, many nations continue to make national commitments under the UNFCCC as if national economic self-interest rather than ethical obligations is an adequate basis for determining national policies on climate change. As a result there is a huge gap between national commitments to reduce greenhouse gas (ghg) emissions that have been made thus far under the UNFCCC and global ghg emissions reductions that are necessary to limit warming to 2 oC, a warming limit that has been agreed to by the international community as necessary to prevent very dangerous climate change. The research agenda outlined below seeks to develop information and analyses that could be helpful in ensuring that nations take equity and justice seriously when making national commitments on climate change. Experience with international human rights regimes demonstrates that national performance on ethical and justice issues can be improved through the development of publically available records of national compliance with justice obligations. If records were available on national compliance with ethical obligations for climate change, they could be used both by the international community to pressure nations to improve performance on their climate change ethical obligations and also create a factual basis that could be used by citizens within the nation to ensure that the national climate change policies consider ethical obligations in setting their emissions targets. Currently there is no international database on how nations have taken equity and justice into account in setting national ghg reduction target or other wise responded to the ethical dimensions of climate change. This research project calls upon researchers around the world to examine the issues outlined in the template below. This is a project of Widener University School of Law and the University of Auckland who will manage the project and provide results to interested governments, NGOs students and citizens and publish the research and summaries of this work. To what extent has the national debate about how the nation should respond to climate change by setting a ghg emissions reduction target expressly considered that the nation not only has economic interests in setting the target but also ethical obligations to those who are most vulnerable to climate change and that any national ghg emission reduction target must represent the nation’s fair share of safe global emission. In answering this question, identify the national ghg emissions reduction target, if any, that the nation has committed to under the United Nations Framework Convention on Climate Change (UNFCCC). In making a national commitment to reduce ghg emissions under the UNFCCC, to what extent, if at all, has the nation explained how it took equity and justice into consideration in setting its ghg emissions reduction target. Given that any national ghg emissions target is implicitly a position on achieving an atmospheric ghg concentration that will avoid dangerous climate change, to what extent has the nation identified the ghg atmospheric concentration stabilization level that the national emissions reduction target seeks to achieve in cooperation with other nations. Given that any national ghg emissions target is implicitly a position on the nation’s fair share of safe global emissions, to what extent has the nation identified the ethical and justice considerations that it took into account in allocating a percentage of global ghg emissions to the nation through the identification of a ghg emissions reduction commitment. To what extent, if at all, has the nation acknowledged that nation’s emitting ghg above their its share of safe global emissions have a responsibility to fund reasonable adaptation measures or unavoidable losses and damages in poor developing countries. How is the concept of climate justice understood by the current government? Have they articulated any position on climate justice issues that arise in setting ghg emissions policy or in regard to the adaptation needs of vulnerable nations or people? Are you aware of any regional, state, provincial, or local governments in your country that has acknowledged some ethical responsibility for climate change? If so, what have they said? Has your national government taken any position on or other wise encouraged individuals, businesses, organizations, subnational governments, or other entities that they have some ethical duty to reduce greenhouse gas emissions. What recommendations would you make to get the nation or civil society to take ethics and justice issues seriously in climate change policy formulation? Please indicate the country you will be working on and include a bio. We will then acknowledge your willingness to participate and provide any additional information. Questions should be directed to Prue Taylor or Donald Brown at above email. D. Additional Guidelines for Research Papers. Each paper should be limited to 8 single spaced pages (16 doubled spaced) or about 3000 words. First drafts of the papers should be submitted by September 5, 2014 to myself and Prue Taylor from the University of Auckland for those researchers that desire to be published in the initial book on the topic. Research papers received after this date will be published on the project website which is under construction. We expect this work will continue to be updated by additional papers on the website and that eventually the website will be the main method of publishing the research work. Approximately the first 10 papers which are relieved and pass a quality control review will be published in the initial book which is part of phase one of this project. All papers should follow the format of Earthcan/Routledge which follows. • Text files must be supplied as Word documents containing plain text with no formatting (such as linked footnotes, section numbers, etc.) and no embedded images. • Please use Oxford English spelling: -ize endings for words such as ‘organize’ and ‘dramatization’; ‘analyse’, not ‘analyze’; ‘colour’, not ‘color’; ‘labelling’, not ‘labeling’, etc. • Figures and tables must have captions, e.g. Figure 1.1 The poverty spiral. Note the convention of giving the number in bold and the caption in italics. • Tables should appear in the chapter file, at the appropriate point in the text, with the caption above the table and note and source (if applicable) below. If the table is particularly large or complex it may be best to supply it as a separate file, as for figures. • Figures must be supplied as separate files (i.e. not embedded within the text files) with the filename clearly identifying it, e.g. Figure 1-1.jpg for Figure 1.1. Preferred file types are jpeg or tif. Try to avoid sending images embedded in Word documents. Please supply line diagrams and graphs in black and white only (not colour) unless you have specific agreement that they will be printed in colour. The text file should just include the caption (and source and note if applicable) in the appropriate place in the text to indicate the correct position for the typesetter. • Image size, when resolution is set to 300dpi, should be as close as possible to the size at which the image is likely to appear in the book. Often this will mean a width of 120mm, although it obviously depends on the chosen dimensions for the book. • Provide full details of source for figures and tables, even if the work is your own. You must obtain permission for Earthscan/Routledge to use any material you submit. • Cite references in the text using the Harvard system of author name and date. For three or more authors use the first author’s name followed by et al. If citing more than one reference consecutively put them in date order, e.g. (Heard, 1984; Heard and Tyler, 1989, 1995; Adams, 1998; Adams et al, 1998). • Notes should be placed at the end of your contribution under their own section. Please do not use footnotes or automatic notes/note numbering. • Electronic files for both text and figures can be supplied to you editor and editorial assistant as attachments by e-mail. If the figures add up to more than about 10MB in total it is likely to be simpler to supply them by posting them on a CD. • Please save the text using one Word document for each chapter. Additional material such as the contents or list of figures should also be supplied using a separate document for each, clearly labelled. • Please advise the editor if anything is missing and has to be supplied at a later date. Often we can start production work on a book with the knowledge that, for example, the acknowledgements will be supplied later. It is important to know exactly what is missing and when you will be able to supply it in order to be sure that it will not disrupt the production schedule. • Please do not insert linked footnotes/endnotes, embedded figures or any other complicated coding. • Avoid numbering your headings unless the text is complex and would be confusing to follow without reference to numbered headings. • It is fine if you only need to use [a] and [b] headings, or even just [a] headings. It is best to avoid more than four levels of heading (i.e. [a], [b], [c] and [d]). • You may wish to have bulleted or numbered lists. Only use the latter where there is a clear hierarchy in the list entries, or if the preceding statement warrants it (e.g. ‘There are four points to be borne in mind…’). • Avoid lists with very long entries – it is often less confusing to use subheadings. • Insert one hard carriage return before and after the list (i.e. one line space above and below) and a tag at the start indicating either bulleted list or numbered list. 3 Third point in a numbered list. ** Third point in a bulleted list. • Tables should appear in the chapter file, at the appropriate point in the text, with the caption (and note and source if applicable) above the table. If the table is particularly large or complex it may be best to supply it as a separate file, as for figures. • Figures must be supplied separately (see below for more about this) so the text file should just include the caption (and source and note if applicable) in the appropriate place in the text to indicate the correct position for the typesetter. If the figure is referred to in the text the position should obviously be as near as possible to that mention. • Provide full details of source, even if the work is your own. You must obtain permission for Earthscan/Routledge to use any material you submit (see note on Permissions, below). • Do not use any special formatting for boxes. • As for tables and figure captions, boxes should be included within the text file at the point in the text at which they are intended to appear. • Insert the square bracket tags [!box! ]’ and [!box ends!] at the start and finish of the box text. • Notes will be grouped together as endnotes, either at the end of each chapter or in one section, grouped by chapter, at the back of the book. The sequence of numbers in each chapter should start at ‘1’ rather than having one consecutive list throughout the entire book. • Do not use automatic footnote and endnote features in Word. • Number the notes consecutively with Arabic numerals, ie ‘1’, ‘2’. • List the notes at the end of your chapter under an [a]-level heading ‘Notes’. • If you quote material from another author’s work, please make sure that you have quoted the passages correctly and supplied an accurate reference. References will be grouped together at the end of each chapter, or at the back of the book grouped by chapter. • We prefer to avoid use of op cit, ibid and idem. Please simply repeat the citation as appropriate. • Include page references where possible, if it will help the reader. They can be either with the citation in the text (e.g. Heard, 1984, p21) or at the end of the full reference; including them with the short citation allows you to use several citations for different pages of a publication with one reference at the end. • List your references at the end of each chapter under an [a]-level heading ‘References’. They should be in alphabetical order by surname of author. In this full list of references, include the names of all authors (not ‘et al’). • If more than one work by the same author is referenced, these should be in date order. Use letters beside the year of publication if two or more by the same author appeared in the same year, as in the Jones examples below; make sure that the citation in the text includes the correct letter). • Internet references should give an exact URL for what is referred to rather than just a home page address, and include a note of when the page was accessed (see Jones, 1984a below). Often it is not possible to be sure of date of publication, in which case put ‘(undated)’. If something has both a print and a web reference (as for many newspaper articles) please give a full print reference if possible, and the URL can be added on the end optionally. It is the author’s responsibility to clear permission to reproduce material protected by copyright; the publisher is indemnified against breaches of copyright by the author in the contract. It is usually considered unnecessary to clear permission for text extracts shorter than 400 words, but if you are in any doubt, check with the copyright holder. Avoid using material which may give offence to readers. Racist and sexist remarks are unacceptable; please avoid sexual stereotypes. It is the author’s responsibility to check the accuracy of the material before it reaches the publisher. It is particularly important that any defamatory or potentially libellous material is checked carefully by a lawyer with competence in that field, and revised as necessary. • We prefer to receive files as tif, jpeg or eps format. Please check with us if you intend to submit figures in other file formats. It is best to avoid using Word documents with photographs or other image files embedded in them; it will result in additional work and poorer quality. • We can accept hard copy (e.g. photographs or transparencies) although the cost of scanning them to produce an electronic file may be passed on (see next point). • If figures are not supplied in the ideal format or to specifications outlined below we are likely to need to carry out additional work on the files or have the figure redrawn, and the cost of this is usually passed on to the author. • Please provide figures to be reproduced in monochrome as black and white (‘grayscale’) images, and provide colour figures as CMYK, not RGB. • Save each image file using the name of the figure as referred to in the chapter text, e.g. ‘Figure 1.1.tif’. If a Figure is made up of multiple images they may be saved as ‘Figure 1.1a.tif’, ‘Figure 1.1b.tif’, etc. Please write clearly, with your intended audience in mind, so that your text is accessible to the appropriate level of readership. Jargon is acceptable in technical texts, but should be kept to a minimum in more general texts, and should be explained thoroughly on first usage. • Use ‘ize’/’ization’ rather than ‘ise’/’isation’ spellings for words like realize, organization, specialize etc. Note that some words – generally those that don’t stem from Latin – cannot take ‘ize’, e.g. analyse, comprise, revise (check in an Oxford English Dictionary if in doubt). However, ‘ise’/’isation’ spellings in certain proper names should be retained (e.g. Organisation for Economic Co-operation and Development). • Use UK English rather than US English. • Spell out in full the first time that they are used, e.g. ‘International Institute for Environment and Development (IIED)’. Thereafter, the short form only need be given. • Extremely common abbreviations need not be explained, e.g. TV, CD, BBC. • Italics are no longer used for common foreign words or phrases (et al, inter alia etc. ), but may be used for more obscure ones. • Italics should be used for the names of books, newspapers, journals, paintings, plays, films, TV series and ships (government papers or policy statements usually appear in inverted commas). The rule is essentially that anything that is a complete thing in itself takes italics (and initial capital for all main words) whereas anything that is part of a work (e.g. a chapter in a book, an article in a journal, a poem from a collection, a particular episode of a TV series) should be unitalicized but within inverted commas. • Use italics sparingly for emphasis. • Use metric units with no space between the numeral and abbreviation, e.g. ‘3055km’. • Currencies other than £, euros or US$ should be converted to one of those three currencies and used instead of or (in brackets) in addition to the currency referred to. • Use a comma as a separator in numbers over 9999, e.g. 41,500. However no comma is necessary for lower values. • Do not use a comma before the penultimate entry in a list, e.g. use ‘rats, mice, gerbils and guinea pigs’, not ‘rats, mice, gerbils, and guinea pigs’. • Use single quotation marks to denote speech; only use double quotation marks when speech is being reported within an extant set of quotation marks. • There is no need for ‘http://’ before ‘www’; e.g. ‘www.earthscan.co.uk’ not ‘http://www.earthscan.co.uk’. But keep the full form in URLs such as http://en.wikipedia.org/wiki/World_population. • Punctuate as normal, i.e. if a web address comes at the end of a sentence in the main text it should take a full stop but not if it comes at the end of a reference.